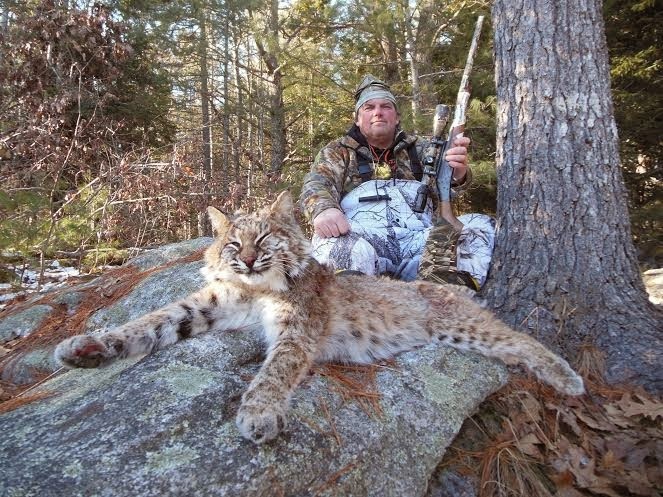 The Maine Outdoorsman: A Reader's Bobcat Hunting Success! The following is a letter that was forwarded to me from the editor at the Maine Sportsman, from a reader that shot this impressive bobcat from the advice he garnered from reading my monthly column. I certainly makes my heart swell with pride when something I write assists another outdoor person in the field and reminds me once again why it is I write. Thanks to Nancy for providing me with Nate's story! My husband Nate is an avid outdoorsman. He enjoys the expanded hunting opportunities afforded by predator hunting. It allows him to basically hunt year round. On the 29th he donned his hunting gear and headed for the woods. He brought with him his screaming cottontail call by quaker boy. His favorite call. He'd read recently, in the Washington county column of the Maine Sportsman, tips on calling in Bobcats by Steve Vose, so heeding the advice outlined in the article, he called a lot longer and waited patiently for the cat to come in. Normally calling in coyotes and foxes he calls for a 1/2 hour and moves if he doesn't call anything in. While hunting for bobcats he's learned to call more frequently and stay on the stand longer. It took an hour of calling to bring this bobcat in for the shot. He shot this bobcat in Bristol. He'd noticed many bobcat tracks in the rabbit hunting area recently which inspired him to go try to relieve some predation on the rabbit population. He had made about his 10th call when he saw the bobcat coming through the furs. It slowly made its way to the brook, Nate was sitting on the opposite side of the brook bank. As it crossed the ice he made the shot. Nate was impressed with the size of the bobcat, the size was unexpected. It is a 24lb female bobcat. Let me know if you need any other details.